Are Your Finances Ready for a Stressful Life Event? What’s This Computer Chip Doing in My Credit Card? Original printing uses Pantone 117 and black on recycled, 70 lb., white, porcelain-silk text paper. The FDIC encourages financial institutions, government agencies, consumer groups, educators, the media and anyone else to help make the tips and information in this edition of FDIC Consumer News widely available to the public. This and other editions of FDIC Consumer News may be reprinted in whole or in part without permission. 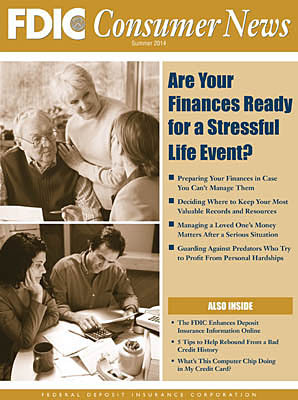 In addition, the FDIC offers this edition online in a PDF version (above) that looks just like the printed publication and can easily be reproduced in any quantity. Space on the back page of the PDF version also was intentionally left blank so that an organization can add its name, logo, a special message and/or mailing information. Go to www.fdic.gov or call toll-free 1-877-ASK-FDIC – that's 1-877-275-3342. FDIC Consumer News is produced quarterly by the FDIC Office of Communications in cooperation with other Divisions and Offices. It is intended to present information in a nontechnical way and is not intended to be a legal interpretation of FDIC or other government regulations and policies. Due to periodic changes in statutes and agency rules, always check the FDIC Web site — www.fdic.gov — for up-to-date information. Mention of a product, service or company does not constitute an endorsement. This publication may be reprinted in whole or in part without permission from the FDIC. Please credit FDIC Consumer News. Find current and past issues of FDIC Consumer News at www.fdic.gov/consumernews or request paper copies by contacting the FDIC Public Information Center. Call toll-free 1-877-ASK-FDIC (1-877-275-3342), write to the FDIC Public Information Center, 3501 North Fairfax Drive, Room E-1002, Arlington, VA 22226, or e-mail publicinfo@fdic.gov. Subscriptions to FDIC Consumer News are available free of charge. There also are two ways to subscribe. To receive an e-mail notice about each new issue with links to stories, go to www.fdic.gov/about/subscriptions/index.html. To receive FDIC Consumer News in the mail, free of charge, call or write the FDIC Public Information Center as listed above.